A quest to find these masters of disguise, the little Cape dwarf chameleons turned out to be more challenging than anticipated. A friend tipped me off to a location out in the country – bearing in mind that they are rarely seen, a threatened species – I was excited to see if I could locate any. Their camouflage makes them hard to spot and sure enough they were well hidden. Eventually after a concerted effort peering intently – there they were, blending in magnificently with the foliage. The species is restricted to the Western Cape area and inhabits a range of different habitats and vegetation types, from fynbos and renosterveld, to indigenous Afrotemperate forests and wetlands. “Waaaaaah,” I yelled as I spotted the puff adder seconds before it was about to strike. With an adrenalin-enriched reflex I leapt clean off the ground and sailed through the air landing a safe distance away. My husband, who was following on the path behind me, fortunately came to an abrupt stop. His astonishment at the scene registered with a few choice words; though I’m not totally sure whether his stunned reaction was because of the athletiscm of his beloved or the raw power of the snake as it too became airborne. Having missed it’s target the momentum of the strike propelled it forward through the air. Quite a sight, I believe. And hubby kept babbling on in awe and even managed to take a few photos with his cell phone as the snake withdrew. It was a magnificent specimen; out of harm’s way I could admire it as it made off through the vegetation casting a baleful look my way. Puff adders are ambush predators relying on camouflage to present an element of surprise to the unwary prey. Their venom is hemotoxic which destroys blood cells and can cause extensive tissue damage. I suspect that I had unwittingly startled this creature and it had acted in defense. It was a near encounter and I was rather shaken. It was a warm and sunny spring day and we had decided to walk the Kanonkop trail in the Cape of Good Hope Reserve. We still had a way to go to the end of the trail so off we set again. Around the next corner, would you believe another slithering reptile, this time a sand snake? By the time we reached the car my nerves were shot and I was gabbing away quite gibberishly. It was good to get home and settle down to a good strong cup of tea. Hubby came back in from the garden, and guess what? He’d found a baby cobra nestled in one of the pot plants…….. never a dull moment. Trending at the moment are the angulate tortoise; it’s mating season and they’re defending their patch against competitors. Truculence is a good descriptive fit for the males sweeping their territory. I was amused to find that as I crossed through one gutsy male’s area he came dashing over to investigate. 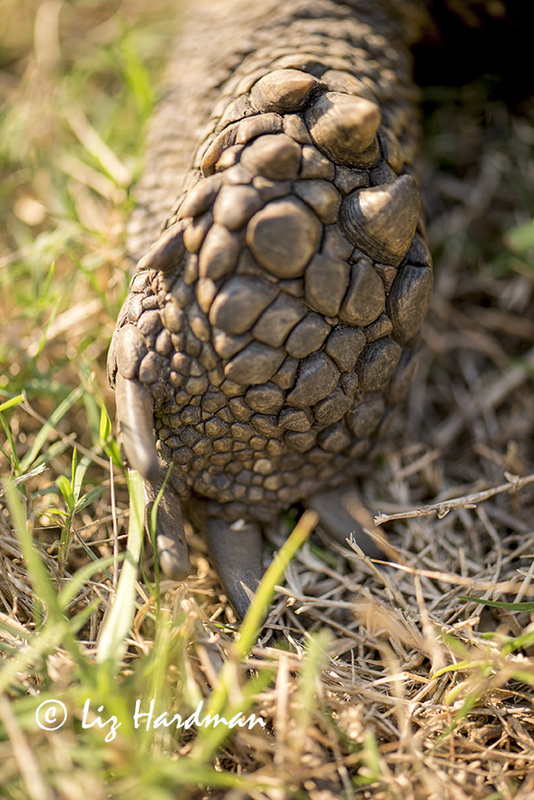 The males have neck long plates with which they flip their rivals and watching the chase, endurance and stamina come into play. One stumble and the game is over. The loser once flipped has no means of righting itself and will die a slow death. We’re noting that there is activity in the area which was affected by the fire last March in the Cape Point reserve. Good to see that they’re making a comeback – even though their shells are charred, they’re in feisty fettle. It’s useful having a set of independently moving eyes. Set in turret-like structures the chameleon can swivel one eye to detect prey and at the same time keep an eye out for predators / photographers creeping up from behind. I was lucky to spot this perfectly camouflaged Namaqua chameleon against the desert sands near Walvis Bay, in Namibia. The sun was blazing down and I happened to notice movement – it’s slow comical gait caught my eye. It was hunting ants. They have evolved ways to prevent overheating in this extreme environment and “stilting” – standing on straightened legs to keep it’s body off the hot sands and moving in extreme slow motion are actions to keep cool. While most other chameleons are arboreal, the Namaqua is a ground dweller, digging holes in the desert sand to reach the cooler layers beneath or taking shelter from the sun in burrows built by other animals. 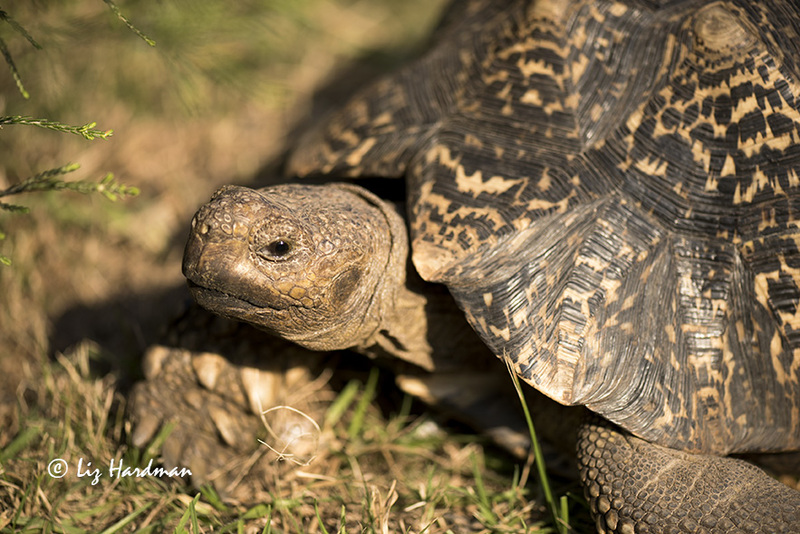 See the close-up details of a leopard tortoise and admire it’s rugged build.